The message of the Qur’an is addressed to all creation, conveyed in the Arabic language. Allaah Almighty says: “We have sent it down as an Arabic Qur’an so that you may understand.” (12:2) Acquiring command over the Arabic language can be relatively easy for those who are native speakers, but can prove difficult for the non-speakers. The study of Arabic, therefore, cannot be taken lightly. The books that can impart knowledge of the Qur’anic Arabic are rare. 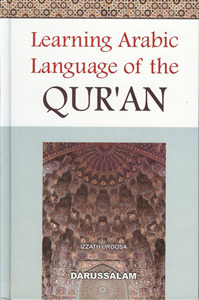 The present book is specifically designed for learning the language of the Qur’an. All examples used in the explanation of Arabic grammar have been taken straight from the Holy Qur’an. This approach aids the beginning student to enter the world of the Qur’an, allowing simultaneous understanding of Arabic grammar and the Qur’an, which is a very special feature of this book. Other components that make this book attractive and useful are the simplicity of the language used, and its clarity and effectiveness of expression in achieving its objective. This book can be used by students of different ages whose intention is to learn Arabic with an eye toward proper understanding of the Qur’an.